What is a Kill A Watt Monitor? 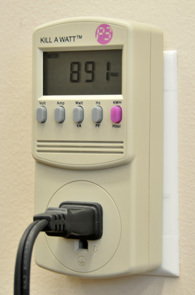 A Kill A Watt Monitor is a device that measures the electrical usage of small plug-in appliances and other devices. You can use a Kill A Watt Monitor to learn which devices use the most energy, and to find devices that use energy when they are turned off (called “phantom” loads). Kill A Watt Monitors are available for check-out from local libraries, or can be purchased at electronics stores. We also have a limited supply of monitors available for check-out from our office. The Kill A Watt Monitor can be used to measure the electrical consumption of 120-volt household electronics up to 1875 watts. 220-volt appliances, such as ovens or clothes dryers, cannot be measured with a Kill A Watt Monitor. Plug the Kill a Watt Monitor into an electrical socket, power strip, or extension cord, and then plug the device you want to measure into the Kill a Watt Monitor. Turn the device on. The voltage will appear on the display. It should read approximately 120V. For an instant reading of the number of watts being used by the device, press the “Watt/VA” Button. You can take readings on several different devices to compare the energy they draw. A lamp with a 60-watt standard incandescent light bulb will draw about 60 watts. A lamp with an equiavelent compact fluorescent light bulb will draw about 15 watts. The Kill A Watt can be used to identify phantom loads. Just turn the electrical device that is plugged in to the Kill A Watt Monitor off and then check the “Watt/VA” reading again to see whether the device draws power when it’s off. Some common sources of phantom loads are devices with built-in clocks, such as coffee makers, or instant-on capabilities, such as cable TV boxes. Also, devices with remote control capability or battery chargers draw power continuously. The Kill A Watt Monitor will continuously measure the power used by a device from the moment the device is plugged in until you unplug it. To get a good average reading, leave devices plugged in for one hour, then press the “KWH/Hour” button to see the total energy consumed. Items that cycle on and off, such as refrigerators, should be plugged in for several hours or overnight. To re-set the Kill A Watt Monitor to measure a new device, unplug the Kill A Watt Monitor and and plug it back in. We also stock a few Kill A Watt Monitors, and a different style of monitor with a longer cord that is useful for measuring the energy use of refrigerators or for customers who might have difficulty bending down to read a Kill A Watt Monitor. Contact us at (503) 397-1844 for more information.